Critics of 3D Printing for personal use make a strong case that the industry segment can only advance so far if it depends upon iPhone cases, coffee cups, and holiday ornaments. True, but 3D Printing does foster innovation where there is a real need in the user’s life that is not being met by commercial sources. Raul Krauthausen is one such innovator whose 3DPrinting solution to a real-world need offers a glimpse into the power of 3D Printing for personal use. Raul’s Osteogenesis Imperfecta, a bone disease he’s had since birth, requires that the Berlin resident get around in a wheelchair. 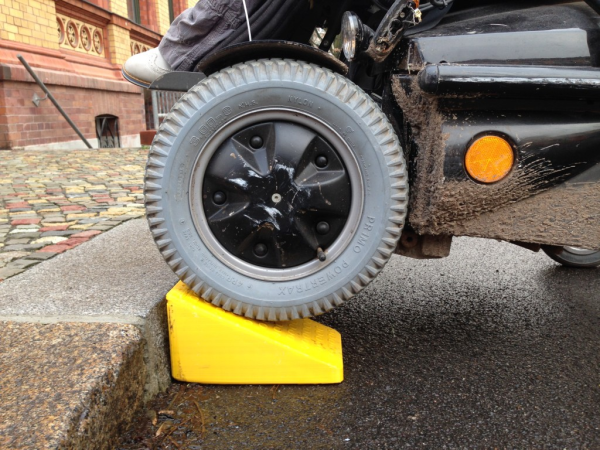 While the world has improved access for wheelchairs, there are still obstacles such as a single step that limit mobility. If you think about it, the handicapped accessible sidewalk “valleys” always seem to be at the end of the block, sometimes a very long block. And even a single step into a home or café is dangerous for a wheelchair user navigating alone. 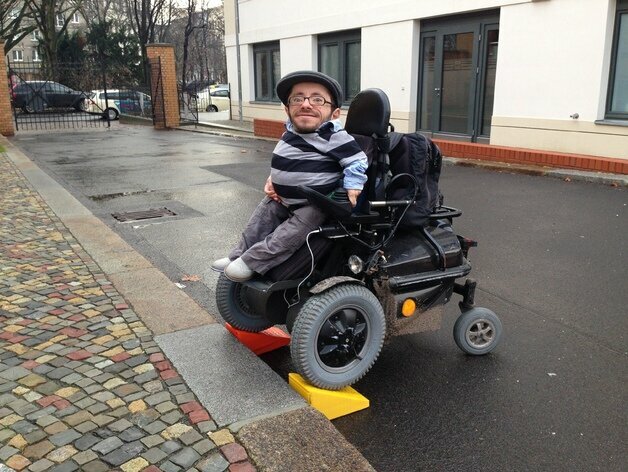 When he was playing with a new MakerBot Replicator 2, Raul started to think about how he might use his new 3D Printer to help those with physical limitations. Necessity being the mother of invention, the first issue that came to mind was his need for a small ramp that would appear on demand. 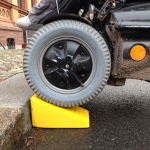 Personal 3D Printers usually use materials that are lightweight plastic, presenting an ideal solution for a portable ramp. 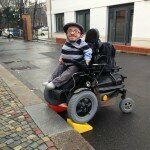 It can be large and strong enough for supporting the wheelchair but can still be easily carried around until needed. In addition, 3D Printing’s unique capability to print complex designs meant that a non-slip surface for safety could be built right into the design with no need for another step in fabrication. Engineers often speak of elegant designs, and this simple solution is not just elegant, it’s inspiring! Raul has posted his design on the Thingiverse website for anyone to download and 3D Print through the Creative Commons – Attribution – Share Alike license. Already there are some modification suggestions to the open-source design. That really is the beauty of 3D Printing in the personal digital fabrication space – sharing innovation with other folks who might have a similar need.